Left wing MP Jeremy Corbyn has the backing of the UK's two largest trade unions after Unison followed Unite in endorsing him to be Labour's next leader. The public services union said Yvette Cooper was its second choice. Initially seen as an outsider in the contest, some bookmakers now make Mr Corbyn the favourite to replace Ed Miliband. The BBC's Norman Smith said: "The Corbyn bandwagon rolls on." He added: "What people thought was impossible, couldn't happen, wouldn't happen, may well happen." Unison's endorsement does not mean its members who have chosen to be affiliated to Labour will necessarily vote for the Islington North MP, as they are free to cast their votes as they choose. But it is seen as a blow to Andy Burnham, who had hoped for union backing for his campaign. Sources in his campaign sought to present the decision as a setback for Mrs Cooper, who they said was confident of winning Unison's backing. Liz Kendall is the other candidate in the contest. Unison general secretary Dave Prentis said: "Jeremy Corbyn's message has resonated with public sector workers who have suffered years of pay freezes, redundancies with too many having to work more for less." He told Channel 4 News nine of the union's 12 regions had nominated Mr Corbyn. The union also said it would nominate Angela Eagle in the deputy leader contest, with Stella Creasy as its second choice. Unison represents 1.3 million workers, including 28,000 Labour Party members and around 15,000 who are registered to vote in the leadership contest. The third largest union, the GMB, has said it will make no formal recommendation. Labour's new leader will be announced at a special conference on 12 September. 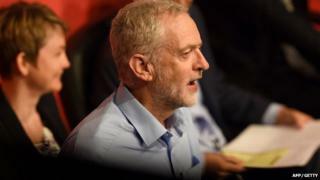 The popularity of Mr Corbyn's campaign has sparked a row within the party, with warnings from senior figures warning against a shift to the left. Mr Corbyn, who topped a recent YouGov poll, has more nominations from local constituency parties than any other candidate, followed by Mr Burnham. Although these nominations have no direct bearing on the result, they are seen as a useful indicator of the candidates' popularity among members. Mr Burnham's team sought to counter the figures by releasing their own polling data suggesting their candidate is ahead by almost 10 points. Mr Corbyn has said he only wants the backing of "genuine Labour" supporters after claims some "hard left" sympathisers and Conservatives were registering for £3 just in order to back him. The party has played this down, saying careful checks are being made on everyone who has signed up. But on Twitter, Croydon North MP Steve Reed said a Trade Union and Socialist Coalition candidate who stood against Labour in May had signed up, adding: "Hard left infiltrating Labour."